The Care Services Discovery module allows MOTECH to consume information from a registry based on the IHE Care Services Discovery Profile. The CSD registry contains information about health organizations, facilities, services and providers. MOTECH is able to consume the registry and represent it in MOTECH Data Services so the information is locally available for queries, updates and tasks. The CSD is used by OpenInfoMan, which is the reference software for the OpenHIE Health Worker Registry. This registry provides a big picture view of a country’s health workforce as well as a single source for supporting patient/provider flows in a Health Information Exchange. More information on the CSD standard can be found in the IHE Care Services Discovery Profile and the OpenInfoMan implementation of that profile on their GitHub page. In some implementations, OpenInfoMan may be deployed within the OpenHIE stack behind a firewall. OpenHIM is the Interoperability layer for OpenHIE. It responds to CSD requests from point of service applications like MOTECH and is able to forward those requests to OpenInfoMan. The same requests to OpenInfoMan can be made to OpenHIM. OpenHIM is the system that provides access controls and auditing of requests. MOTECH is positioned to operate as a CSD consumer in the OpenHIE stack, not as a provider. The system is fully capable of connecting directly to OpenInfoMan or to OpenHIM as defined in the OpenHIE Query health worker and/or facility records - V1.0 workflow. Therefore, MOTECH can act as a point of service application or as an interoperability layer in this regard. The specific infrastructure is dependent on your needs. Task Actions can fetch and update the CSD registry using REST or SOAP, allowing you to trigger updates on events, a defined schedule or when there’s a resource conflict in another task. After installing the module, you must configure the connection. 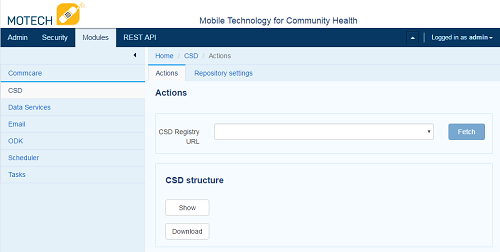 Click Modules > CSD and you are presented with the CSD dashboard that allows you to fetch registries, show or download the full CSD structure in XML format. CSD Registry URL: this is the URL of the XML or WebService. Communication protocol: REST or SOAP depending on the registry to which you connect. (SOAP protocol only) Last modified: This is the last modified date of the SOAP protocol, which allows you to query the resource from a particular point in time. Run every: Insert a number and time period from the drop-down menu to update the registry in regular intervals (i.e. Run every ‘24’ hours). Once you complete the settings, click Save. The URL will now be available on the Actions tab drop-down menu. Click the button to fetch the registry and store it in MOTECH. 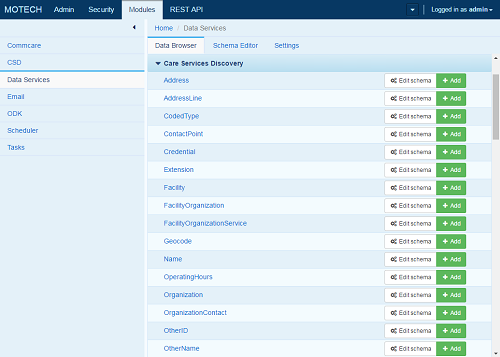 The CSD module stores all imported information in MOTECH Data Services in the Care Services Discovery Module. Click Data Services in the left navigation of the Modules screen. Scroll down until you see the blue bar labeled Care Services Discovery. Each entity within this module represents a table in MDS. Click on any entity to view their contents. Each table relies on MDS relationships to populate them. For example, the Provider entity has a relationship with the Person entity so the person can be referenced with multiple names, addresses, contacts, etc. Facility Provides a list of facilities, their address and operating hours. FacilityOrganization Provides a list of Facility Services by organization. FacilityOrganizationService Provides a list of services and times the service is available by facility and organizations. Organization Provides a list of organizations with address specializations and coded types. OrganizationContact Provides a list of people who are the contact for each organization including their provider ID. Person Provides a list of all people in the system with their contact points, addresses and demographic information. Provider Provides a list of all providers in the system with the languages they speak, specialties and coded types. ProviderFacility Provides a list of all providers at a facility. ProviderFacilityService Provides a list of provider services at each facility. Provider Organization Provides a list of organizations the provider is affiliated with including address and contact points. The CSD module can act as a task trigger and task action. Also note that data is available as a task data source through the Data Services lookup features. A full explanation of the tasks module can be found in the Implementer’s Getting Started Guide. This task trigger will fire when a user pushes the fetch button in the user interface initiating a manual fetch of a given repository. This task trigger will fire when a CSD is fetched based on a schedule as defined in the CSD Repository settings. This task trigger will fire when a CSD is fetched from a task action. This task action allows you to fetch a repository using the REST protocol. All you have to do is specify the URL of the repository. This task action allows you to fetch a repository using the SOAP protocol. All you have to do is specify the URL of the repository and a last modified date. This section defines advanced workflows available with the CSD module, allowing users to configure MOTECH to better meet their needs. The SOAP based service requires that we define a Last Modified date. We often only want to get the latest data from the web service. This can be done by creating an MDS entity to store the last modified date and then referencing that modified date as a data source and updating it as a task action after the update is complete. Now that we created the entity, we need to populate it with one record so we can update that record every time a task runs instead of creating a new record each time. Click on the field labeled Last Updated Date and click the Now button in the bottom left of the date picker and Done on the bottom right. Drag the orange bubble labeled Data Services.soap_last_updated#0.Last Updated Date to the Last Modified date of the task action.